Check out our test packs below to see which one is best for your upcoming hunts. Testing Bonus! 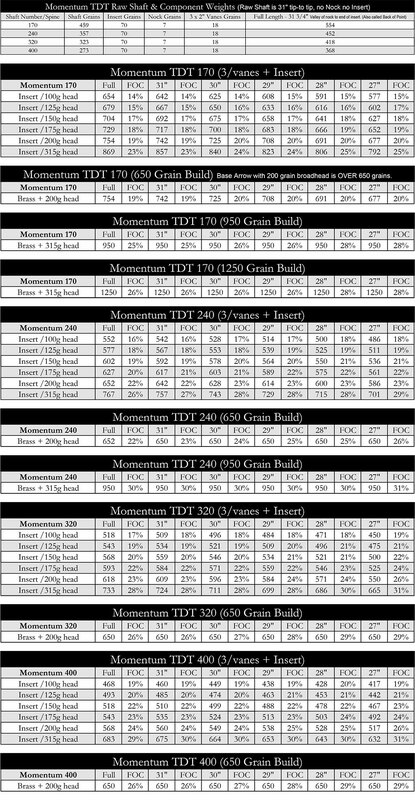 Order a dozen or more Momentum TDT arrows within 30 days of your test pack order and we will deduct the cost of the test pack from that order. If you have technical questions or if you would rather place your order over the phone call us at 888-697-9828 Ext 23. GrizzlyStik arrows and broadheads are a system - they're designed and built to work together and increase your odds of complete lethal penetration at any angle - even when things go wrong. No one else has it - and no one else offers you the option to test their arrows or broadheads - so you know for sure what works best for you before you stock up for the season. GrizzlyStik carbon arrows are the only tip-to-tail tapered arrows on the market. Tapered arrows increase your accuracy, flatten your trajectory, and penetrate better than parallel arrows. True built in FOC! GrizzlyStik arrows optimize penetration potential because of their tip to tail taper with built in FOC (forward of center balance point). The raw shafts have an amazing 5% FOC with no nock and no point! 1) Strength Forward - Theyr'e strongest right behind the point - where you need strength the most. 2) Spine Forward - They are stiffest at the front so they recover from the shot faster than parallel arrows and they flex much less at impact - and that means more pile-driving penetration. 3) Weight Forward - Higher FOC (Forward of Center) percentage - which give better trajectory, better down range grouping, much more resistance to wind drift - and way more penetration potential than a lower FOC can offer. Which test pack should you try? 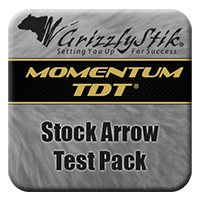 If you're used to lighter conventional set-ups with total arrow and braodhead weights in the 400's, check out our GrizzlyStik Stock Test Pack. 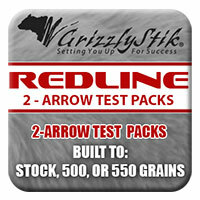 If you're looking for a true one arrow that can do it all in North America and all African Plains game, then try our GrizzlyStik 650 Test Pack. This test pack will show you just how easy it really is to shoot 650 grain arrows. The 650 grain system will work on anything from whitetail deer and hogs to elk, moose, bison and even brown bear and grizzlies. 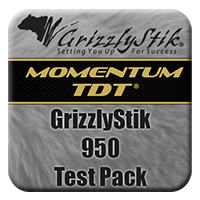 For those going for Cape buffalo, Asiatic water buffalo, giraffe or animals of that size, try the GrizzlyStik 950 Test Pack. We have record of over 1,400 successful buffalo haversted with the GrizzlyStik 950 system - no other system is even close. Elephant and Hippo hunters, get the GrizzlyStik 1250 Test Pack. The GrizzlyStik 1250 system has taken more than 75+ elephant now - no other system is even close. Do the testing, have the confidence that your setup is the best you can get - then go get your trophies with total confidence. Here's the best part! 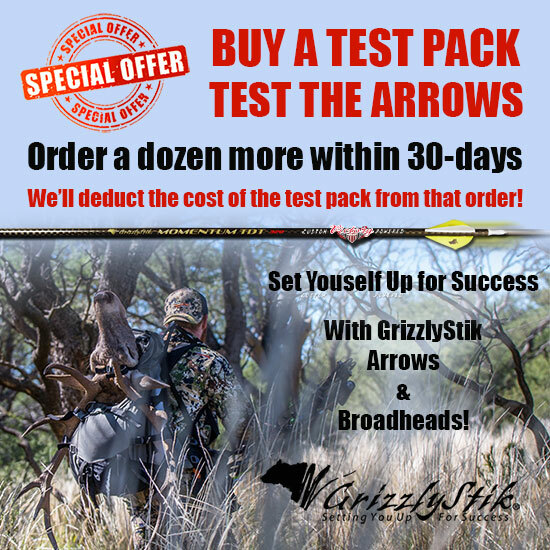 (Incentive to test) If you order a dozen GrizzlyStik arrows within 30-days of us shipping you your test pack, we will rebate you the cost of your original test pack on that order. Your testing ends up costing you next to nothing. If you're serious about your bowhunting - set yourself up for success with the GrizzlyStik Momentum TDT System.